The Athenians favorite weekend haunt and well worth a quick visit as journey time is only one hour from Athens. Not too overrun with tourists even in the height of the season and site of the beautiful Temple of Aphaia. 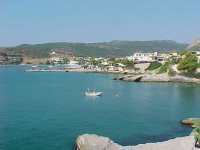 The Saronic chain is the most accessible group of islands to Athens. If you want to experience the magic of the Greek Islands you may be surprised to know that you can reach Poros in less than one hour from the capital. You will find that many Greeks take short weekend breaks to the Saronic Islands. Each island is also very close to the Peloponnese mainland so if you hire a car you can visit legendary sites such as Mycenae, Nafplion, Epidavros and Arcadia.